Math used to be all rote memorization and pencil-to-paper equations disconnected from the real world, but more and more teachers are realizing the importance of making practical, relevant connections in math. We asked our audience of educators: How do you use the real world to teach math? We’ve collected some of the most interesting answers, ways teachers are connecting math to the everyday lives of their students. 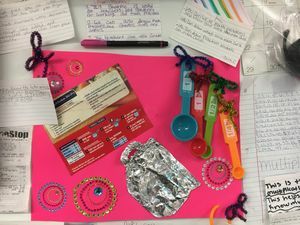 To get her fifth-grade students thinking about the math in their lives—and to head off the inevitable “we’ll never use this in the real world” complaint—Samantha Baumgardner, a teacher at Woodrow Petty Elementary School in Taft, Texas, has them bring in a common item and write three ways it relates to math on a notecard. These objects form the class’s real-world math wall. Students bring in objects to put on the wall, with descriptions of how they’re connected to math. Samantha Baumgardner and her students and their real-world math wall. Students measure the flow rate of water at the classroom faucet. At North Agincourt Jr. Public School in Scarborough, Canada, Krista Dunlop-Sheppard, a bilingual resource and home school teacher for grades 1–6, has her students conduct a water audit at home and at their school. 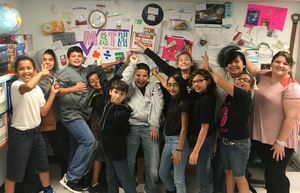 Her students have a wide range of math ability: In a single class, she has students with learning disabilities, students who are gifted, and students who have no diagnoses but need extra support. 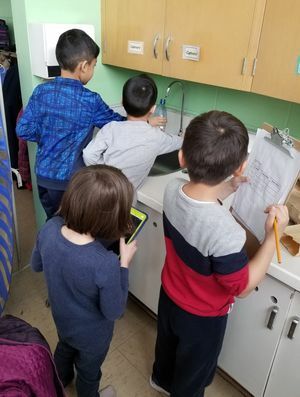 Modifying a pilot project created by the Toronto Zoo Education Department, students add, subtract, find averages, and measure liquids—like the flow rate of all the water fountains, toilets, and urinals—to measure the amount of water their school uses in a day. They also interview custodians to discover their daily water usage while mopping floors, and do online research to find out how much water the cafeteria dishwasher uses. When finished, students suggest ways for the school to conserve—like collecting rainwater in a barrel to water plants, and cleaning paint brushes in a bucket instead of using running water. In June, students repeat the water audit and see if the changes they implemented made a difference. 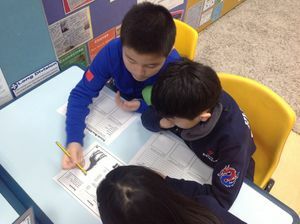 There’s nothing wrong with using money to teach negative and positive numbers, or pizza to introduce fractions, but Justin Ouellette—a third- to fifth-grade International Baccalaureate educator at Suzhou Singapore International School in China—takes these exercises a memorable step further, bringing in menus so students can act out true-to-life restaurant scenarios. Going dutch on dinner and tipping reinforces addition, subtraction, decimals, and percents, Ouellette says. If you need a good resource: Ouellette has used this free lesson plan about a fictional eatery called the Safari Restaurant. Justin Ouellette’s students practice their math on printouts from the fictional Safari Restaurant. Making real-world math connections can happen outside of math class, too. While reading Elie Wiesel’s Night, 12th-grade students at Kittatinny Regional High School in Hampton Township, New Jersey, calculate the volume of 11 million pennies to help them imagine the impact of the lives lost during the Holocaust. Ashley Swords, a resource center English teacher for grades nine to 12, uses pennies because they are small and plentiful and allow her to recontextualize a familiar, everyday object. 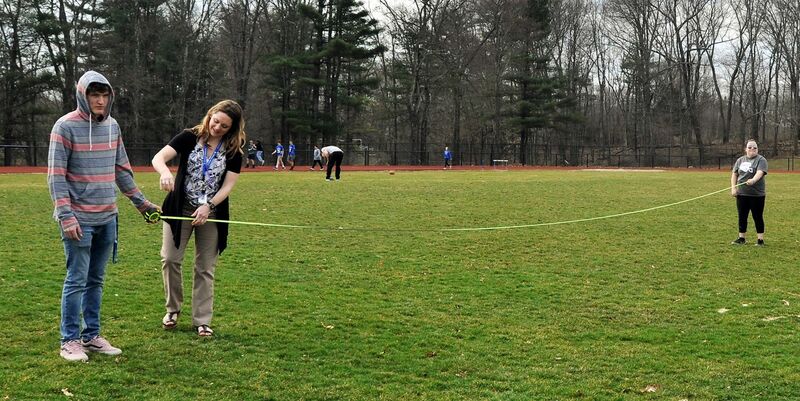 Students perform other calculations to amplify the impact of the lessons—at the school’s football field, for example, they determine the volume of Swords herself and then calculate how many football fields would be needed to bury the 11 million Holocaust victims if they were each Swords’s size and were buried in graves 10 feet deep. 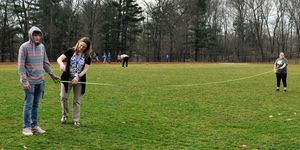 Guesses ranged from two to 20 football fields, with students finally concluding that it would take about 343 football fields. Swords knew this lesson was a success when a group of six seniors got emotional after completing it and realizing the magnitude of the deaths in World War II. Recipes were perhaps the most popular idea among the elementary teachers who responded to our request for real-world math examples. Fifth-grade teacher Gabi Sanfilippo of Meadow Ridge in Orland Park, Illinois, for example, asked her students to write down one to two ways they used math outside of the classroom during spring break—and more than half of her students wrote that they practiced using measurements and fractions while baking and cooking with their families. 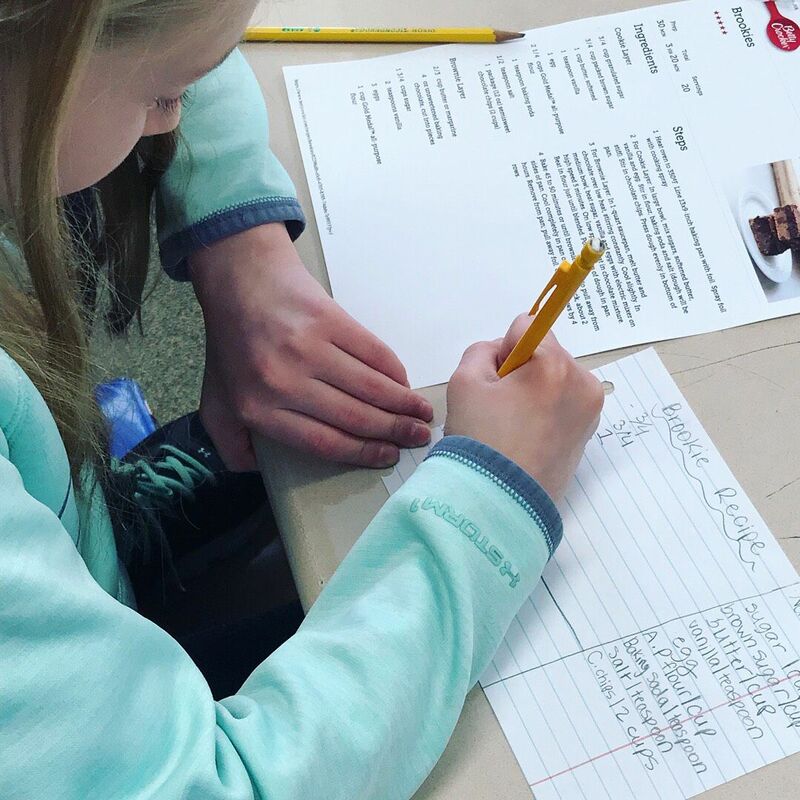 One of Gabi Sanfilippo's students changes the amounts of ingredients needed for a brookie—a brownie-cookie—to practice fractions. In class, students practice halving, tripling, or quadrupling recipes based on how many people they’d cook or bake for. Most teachers don’t actually cook in class, but often students cook at home to practice their new skills. Another educator, Elizabeth Eagan of Bastrop Independent School District in Texas, brings in a toaster oven to bake in class. She teaches the visually impaired, from newborns to 22-year-olds, using recipes in large print, braille, or audio to show the real-world application of adding and subtracting fractions. 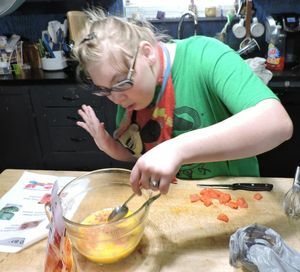 Eagan prints out recipes at 129 percent for her low-vision students or converts the text to braille using braille transcription software, and then prints them using a braille printer. She purchased Stir It Up, a cookbook in both braille and print that makes it easier for families and teachers to help their students if they haven’t mastered the tactile language. Students may use electronic magnifying glasses like Pebble and Ruby. For audio, Eagan records herself reading the recipes, has a peer or parent help, or uses the app Seeing AI, which can scan and read recipes aloud. Elizabeth Eagan bakes at the home of one of her students with her parents. Eagan’s student multiplied the ingredients by four to make breakfast for her family. Many teachers make real-world math connections to grocery shopping. Leanna Agcaoili’s second-grade students at Joseph J. Fern Elementary School in Honolulu, Hawaii, are tasked with creating a healthy meal for their family on a $20 budget. On a grocery store field trip, students practice adding and subtracting one- and two-digit whole numbers—and learn about money and budgeting in the process. Agcaoili says she’ll do a practice run in class next year, noting that the first time through some students had difficulty finding their ingredients. After Halloween, Dottie Wright Berzins, a retired public school teacher, had her students bring in wrappers from their favorite Halloween candy. Depending on the age, the students then created graphs showing their favorite candies. Younger ages built life-size candy bar graphs, marking the x- and y-axis with masking tape on the floor and using the wrappers to represent the bars. Older students constructed tally charts and paper graphs, and followed ads, tracked which brands advertised more, interviewed peers about their favorite candy, made predictions, and created what-if scenarios—like what if the price of chocolate increased—how would that variable impact the graph?